Raise your profile at our conferences and workshops. Sponsoring a conference through a thought leadership presentation, moderating a rotating roundtable discussion, or even taking an exhibition stand at a workshop, are fantastic ways of raising your company’s profile within our niche HR and employment related events. Whether you are looking to increase your brand awareness, promote new and existing product and service offerings, or get access to your targeted prospects, joining us may be a good opportunity for you. We can tailor specific packages to help you meet and influence the people who are going to ensure the growth of your business now, and in the future. With a clear understanding of your overall marketing strategy, we will work in partnership with you to develop a bespoke marketing solution to meet your objectives. We will ensure that you enjoy all the benefits of association with the right event, targeted at the right delegates, with a promotional package that underpins your marketing strategy. 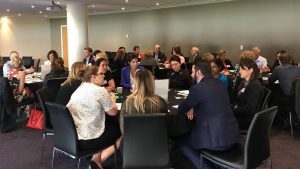 Rotating roundtable discussions at recent Employee Performance Management & Development event. Contact us at [email protected] or call +61 2 9188 8999 to discuss further.